Our collection is incomplete, but has no gaps between Jan 18, 1986 and June 20, 2001 and includes many bound volumes. 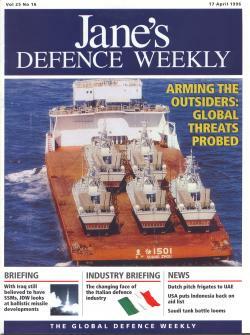 Left: from the 17 April 1996 edition, the cover photo is of five of the Hudong class fast attack craft delivered to Iran by China. Availability: some boxed, single - some in bound volumes; details on request. We are actively collecting back issues of this magazine; if we already have, or receive more, doubles - we will gladly exchange with other collections. Please E-mail us. Published by the Jane's information group, a member of the Thompson Corporation.